We know that Ben Franklin didn't really want to make the turkey the national bird. But what other Turkey Fun Facts™ are out there for us to devour? Feast your eyes on this megamix of Meleagris gallopavo truths. Over 80 percent of all turkeys raised globally are eaten in the U.S. According to the National Turkey Federation, turkey is an American pastime: More than 240 million turkeys were raised worldwide last year, with 200 million of those turkeys consumed in the United States. 46 million of those American-consumed turkeys were eaten at Thanksgiving, 22 million at Christmas, and 19 million at Easter. Talk about some hearty appetites: The average turkey weight at slaughter has ballooned from 13.2 pounds in the 1930s to a whopping 29.8 pounds in 2014, according to the United States Department of Agriculture's National Agriculture Statistics Service. We can thank the reproductive equivalent of a turkey baster for this. Males are raised to become so large and awkward that they can't get it on, so hens are now fertilized by artificial insemination. The USDA estimates that Americans throw away about 200 million pounds of turkey meat after their meal. The wasted meat would end up feeding each American household up to 11 additional Thanksgiving servings. That works out to about 105 billion gallons of water wasted to raise turkey meat that people will never eat—enough to supply New York City for 100 days. Over the last few years the National Fire Protection Association (NFPA) has seen around 1,300 fires in American homes on Thanksgiving Day, which is triple the amount of an average November day. For the last seven years, Texas has led the U.S. in the number of Thanksgiving deep-fryer incidents. Texas is followed by llinois, Pennsylvania, Ohio, and New York. It's such an epidemic that State Farm has enlisted celebs like William Shatner to make deep-frying safety videos. You just can't use the excuse anymore that the serotonin-inducing amino acid tryptophan is the reason you conk out after dinner. Foods like soy, eggs, lobster, even spinach have higher tryptophan amounts than turkey. In actuality, it's high caloric intake plus increased social interaction that makes you sleepy. But you should probably lay off the Tofurkey, just to be safe. Although many turkeys have been gifted to the White House over the years, the tradition of the pardon is relatively new. 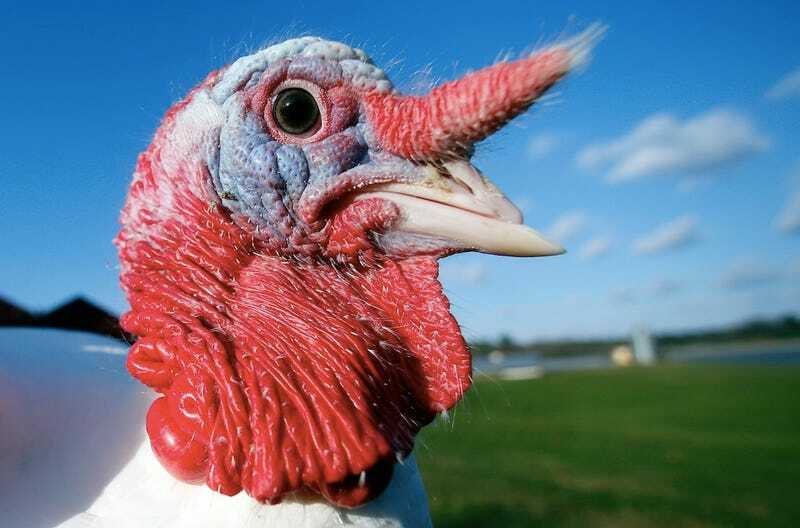 John F. Kennedy began the practice of sending these gifted turkeys to local petting zoos, although no formal pardon was issued. These events eventually became televised, with Ronald Reagan hamming it up with his turkey co-star. In 1987, Reagan was asked if he would consider pardoning Oliver North or John Poindexter after the Iran-Contra Affair and he cracked a joke that he should have pardoned the Thanksgiving turkey. Perhaps this suggestion was taken literally by his successor, because George H. W. Bush made the pardon an official event when he took office two years later. Although the traditional autumnal feast of turkey and fixings had been unofficially celebrated by many Americans since the Revolutionary War era, there wasn't a nationwide date set until President Abraham Lincoln gave a speech in 1863 asking all Americans "to set apart and observe the last Thursday of November next, as a day of Thanksgiving and Praise to our beneficent Father who dwelleth in the Heavens." In 1939, President Franklin D. Roosevelt moved Thanksgiving to the third Thursday of the month to add another week of holiday shopping to a nation still recovering from the effects of the Depression. 16 states refused to make this change and for two years the country remained divided in its turkey-consuming celebrations. In 1941, FDR compromised and after a long battle in the House and Senate, Thanksgiving was relocated to the fourth Thursday of November. And thus, Black Tuesday beget Black Friday. They can also run about 25 mph. They're highly intelligent. Their gobbles can be heard a mile away. And they're known to eat small reptiles. Need any more reasons to be terrified of these things? There are five subspecies of the North American wild turkey which are found across 38 U.S. states and four Canadian provinces. Of all these, the Eastern wild turkeys are the biggest, growing up to four feet tall and weighing more than 20 pounds. The wild turkey neared extinction in the 1930s, and as recently as 1973, there were only 1.5 million wild turkeys in North America. Conservations efforts have brought them back. Something you'll definitely want to bring up at the dinner table: Turkey gender can be identified by the shape of their turds. Male turkey poop looks like the letter J and female poop is spiral-shaped. Should you ever need to track one. But remember: They can run faster than you.